The day before a trip, I almost always find myself facing the same dilemma while packing. What should I bring? What are the necessities? What should I leave behind? I always tend to err on the side of caution. Consequently, I always pack more than I need. I mean, I’d really rather be safe than sorry. Besides, it’s fun to to play with new products given the opportunity and I brought with me a few new things I hauled shortly before the trip. 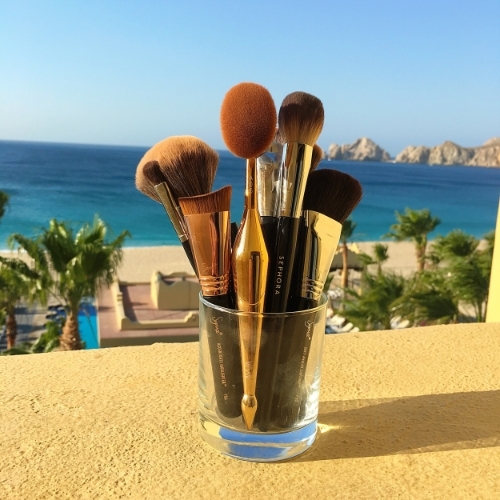 Today’s image heavy post will feature the makeup, skincare and beauty tools I recently took with me on a trip to Cabo San Lucas, Mexico. 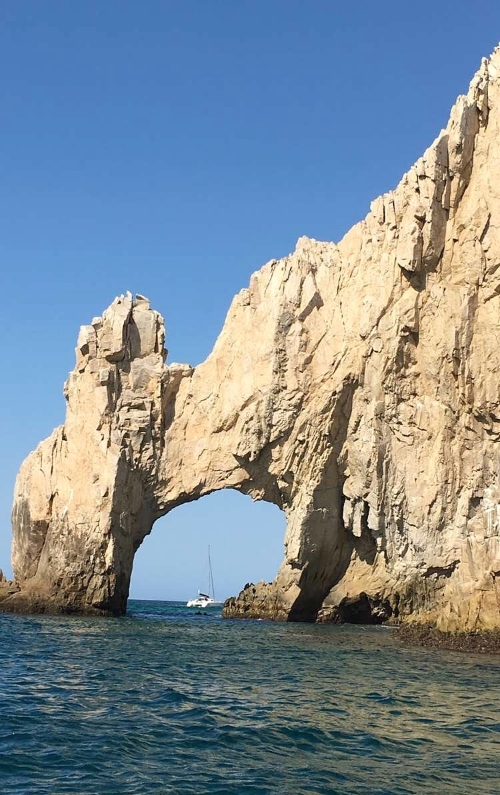 I could not help but take full advantage of the scenic stretch of sand and sea while there and herein you’ll also find images that reflect the gorgeous backdrop I had the pleasure of partaking in as well as some candid snapchat images of my trip. In the makeup category, I brought a pretty exhaustive, yet varied list of products for the eyes, lips, and face. Did I use every single item I brought with me? The honest answer is no. However, these products proved worthwhile, since it helped me to create effortless looks that took me from daytime to evening. 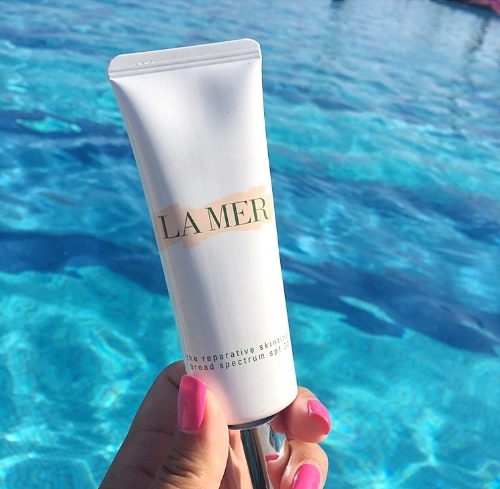 In anticipation of the hot, humid Cabo weather, I brought the LA Mer Reparative Skin Tint, which contains SPF and boasts reparative properties containing their proprietary Miracle Broth in addition to my favorite Marc Jacobs Beauty full coverage foundation for the evening. 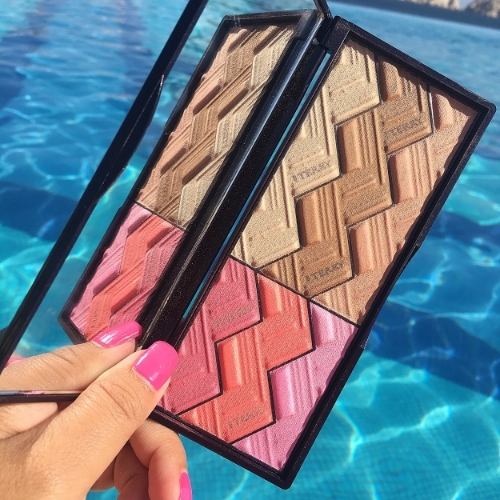 Summer is all about beautifully bronzed and glowy skin and my effort to achieve this was made evident by the numerous bronzers and highlighters I brought with me on the trip–both in cream and powder forms. Additionally, I brought many all-in-one, multi-use products and a large assortment of lipsticks, lip stains, and lip glosses, because a girl needs options! 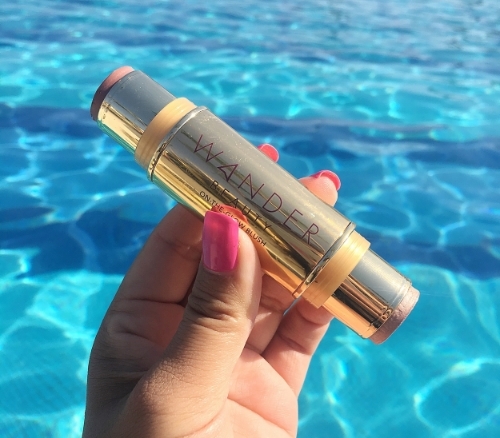 My light weight base during the day, keeping my skin looking even toned and protected while delivering coverage that wore well throughout the day. Heavy on my rotation was the By Terry Sun Designer Palette in Tan Flash Cruise. 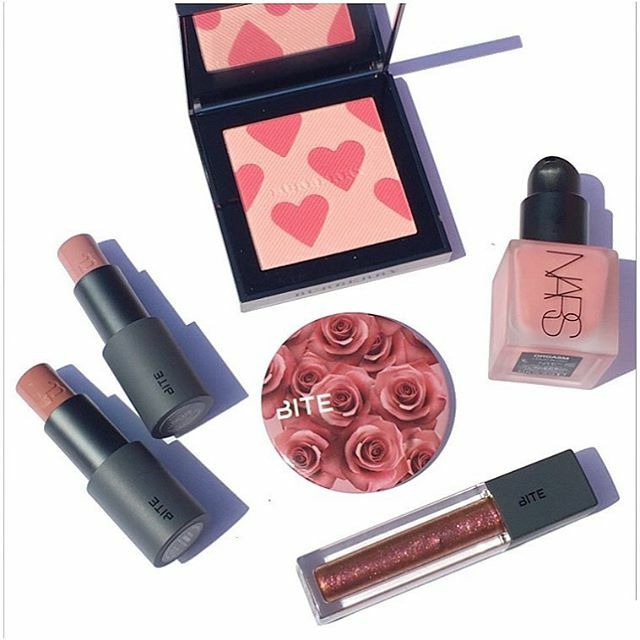 An endlessly pretty all -in- one compact for the face, a gem I look forward to using over and over again. 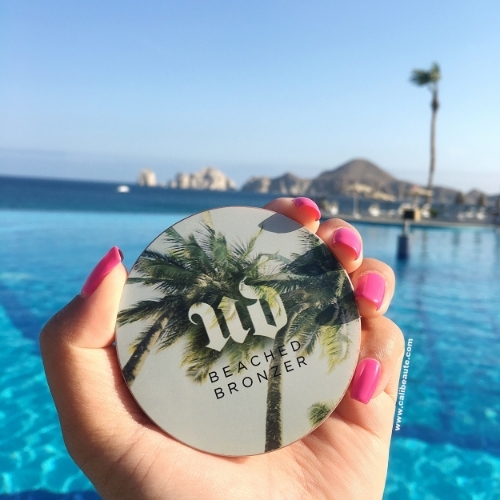 The Urban Decay Beached Bronzer in Bronzed was another perfect companion with a lightweight, silky, yet creamy texture that blended beautifully on my skin. 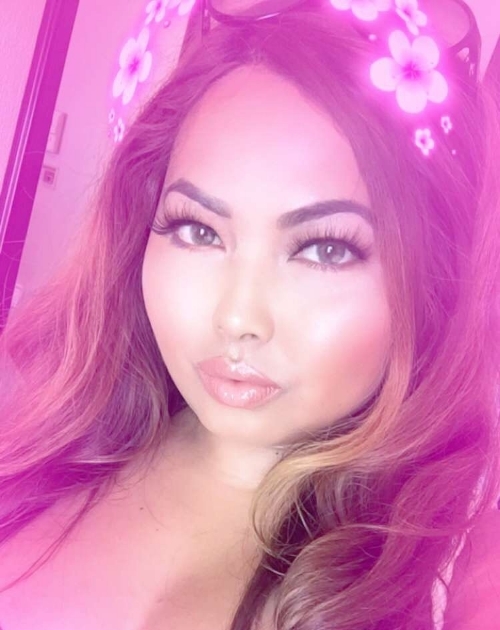 I wore this perfectly portable Glowstick cream highlighter every day while on my trip. 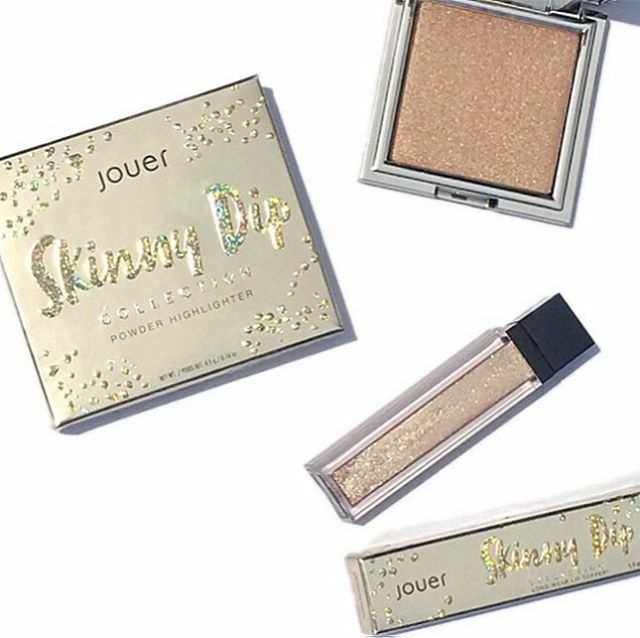 It provided a beautifully luminous natural dewy glow. My full review here. A match made in heaven. 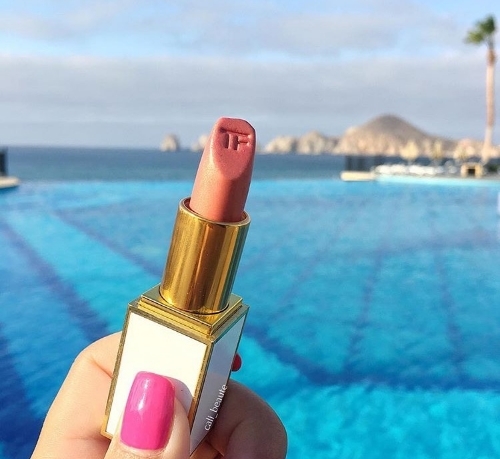 Tom Ford’s Skinny Dip by the infinity pool. 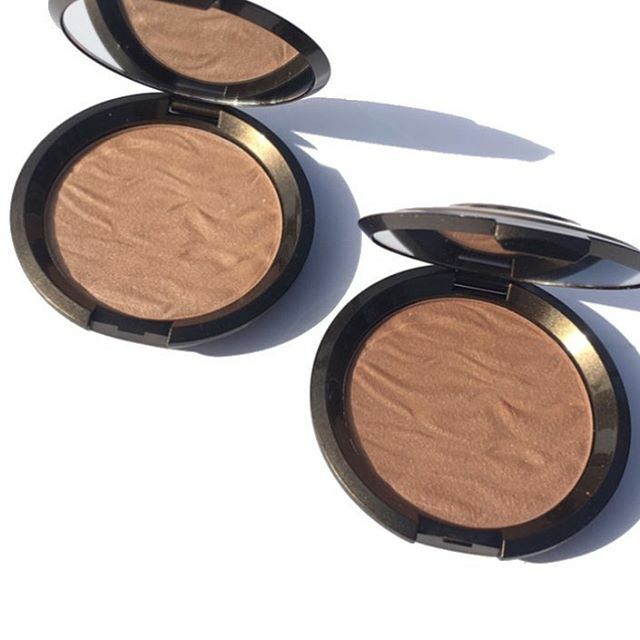 This dual ended On-the-Glow Blush and Illuminator by Wander beauty was another favorite on the trip. Its cream-to-powder formula glided on oh so easily and the color payoff was beautifully subtle, yet buildable. 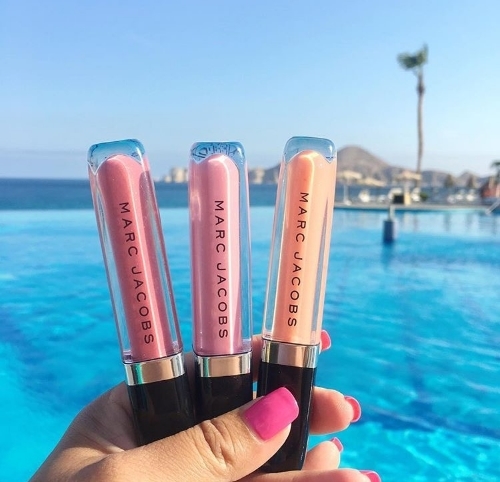 I am completely enamored by the Marc Jacobs Beauty lip lacquer lip glosses. It’s peppermint scented with a formula and finish that I absolutely love. 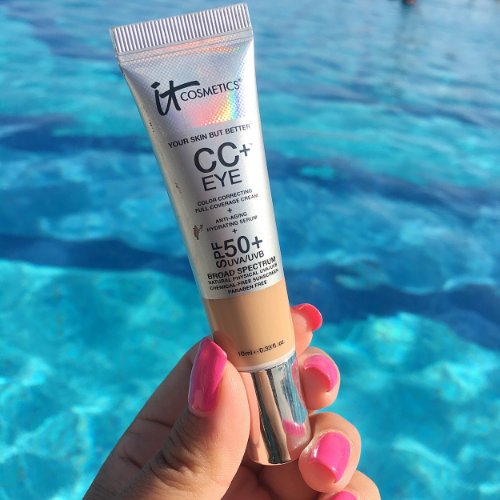 I am really impressed with the It Cosmetics CC+ Color Correcting Full Coverage Cream. It has an SPF of 50+! and provided smooth, even coverage through out the day. 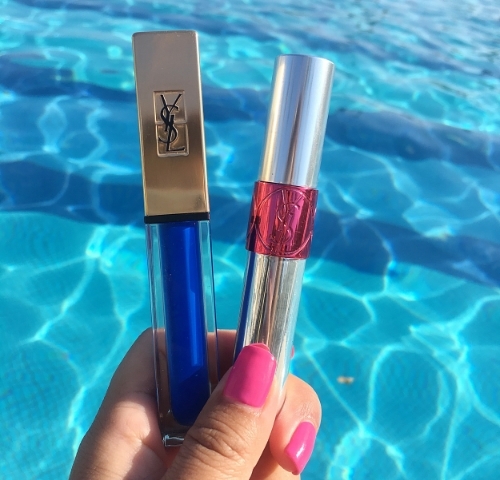 I recently purchased the YSL Beauty Mascara Vinyl Couture in the color Blue and could not help but bring it on the trip. Though it is not officially described as being waterproof it had great lasting power. For a dose of lasting hydration, my YSL Tint-in-Oil keeps me covered. 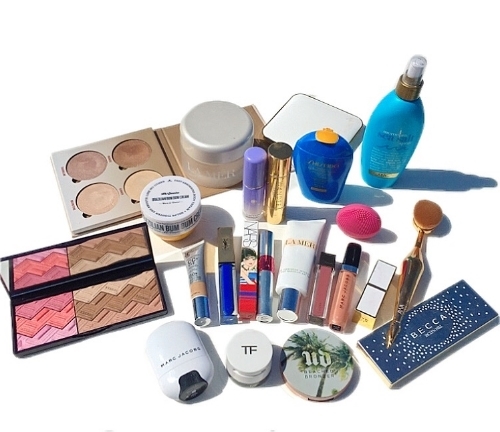 If you are a beauty addict like myself, you have probably acquired many deluxe samples and free gift with purchase items throughout the year. 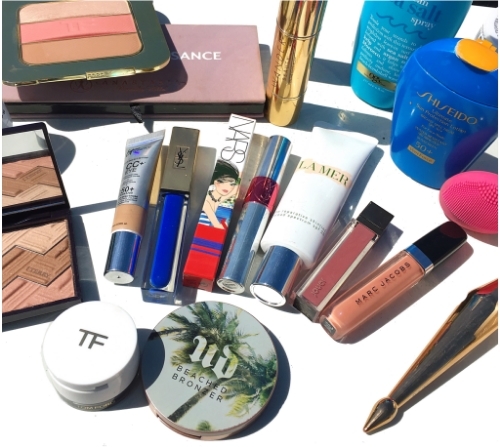 I’ve amassed quite a bit of these beauty perks and deluxe samples through the many beauty offerings from Sephora, Nordstrom, and other retailers. They are the perfect size for travel and when the opportunity arises, I put them to good use. I brought several deluxe size skincare items on my trip, which included different cleansers, lotions, serums, on-the-go masks in addition to a new skincare device called the Foreo Play to put to the test. A top priority of mine was to ensure that I was covered in the SPF department and to ensure my skin felt hydrated throughout my stay. 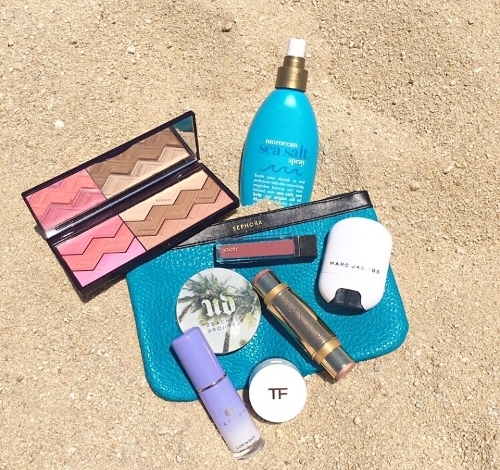 Consequently, I brought 3 full size products for sunscreen and body care while the rest were deluxe sized samples. 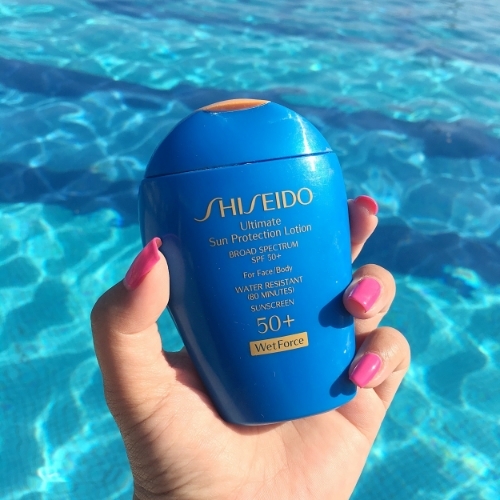 The Shiseido Ultimate Sun Protection lotion has never failed me, providing a lightweight, non greasy texture for my face and body while keeping my skin protected from the sun’s harmful rays. I first discovered the Super Goop line while purchasing one of Sephora’s Sun Safety Kits. 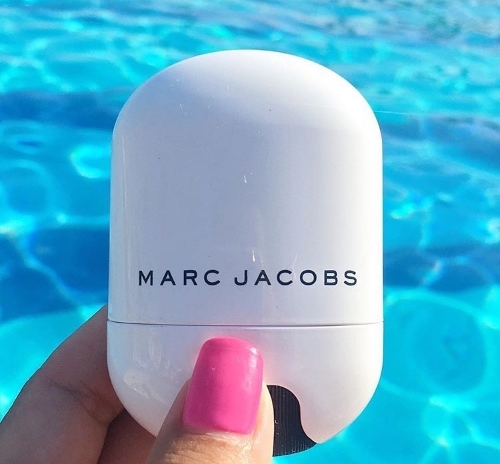 The spray top makes it convenient and easy to apply sunscreen and it quickly became a favorite for not only me, but for my boyfriend as well. 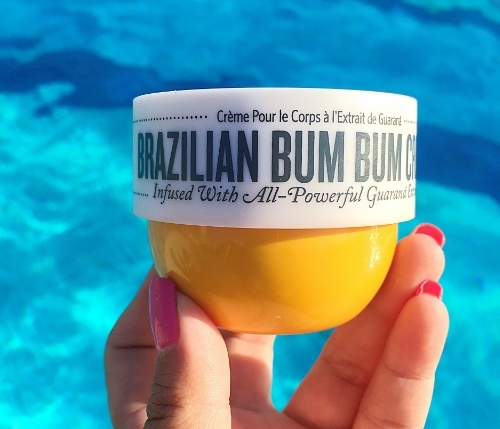 The Brazilian Bum Bum Cream by Sol De Janeiro smells absolutely amazing, is fast absorbing and contains an ingredient called gurana, a Native Amazonian plant whose fruit contains a potent form of caffeine. It kept my skin feeling hydrated all day long and I am now looking forward to picking up its full size counterpart! 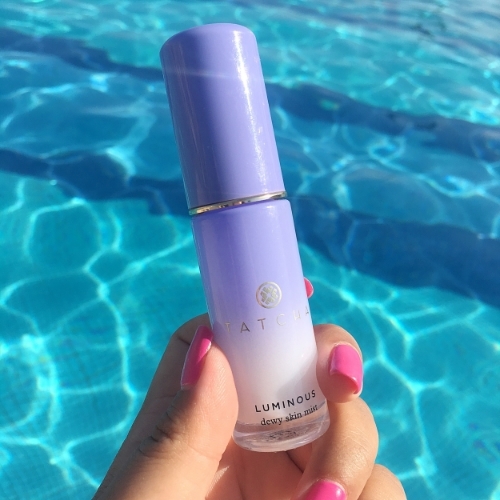 The Tatcha Luminous Dewy Skin Mist (travel size) was so refreshing to spritz on my face. I used it constantly—at day time, at night, before my flight and shortly after. It really is the perfect travel companion. 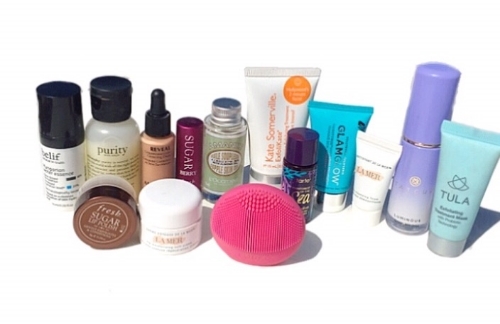 A round up of the skin care products I brought with me on my trip. I also tested the Foreo Play on my trip and a review will be coming soon on the blog. 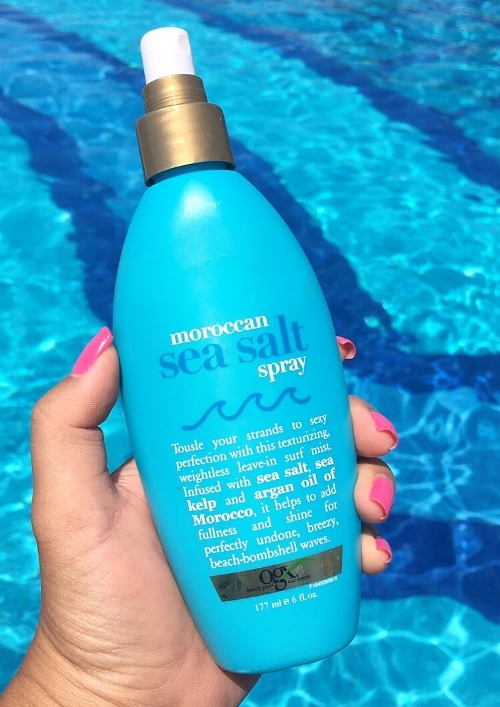 One item product that was an absolute must for me on the trip is the Moroccan Sea Salt Spray by OGX Beauty. I have taken this Sea Salt Spray with me before on my travels to beach destinations. It keeps my naturally wavy and frizzy hair tamed, smells great and the result is amazing texture, soft waves, and a very, easy breezy look. This image was taken directly from my snapchat, a spill of the beauty products in my bag. 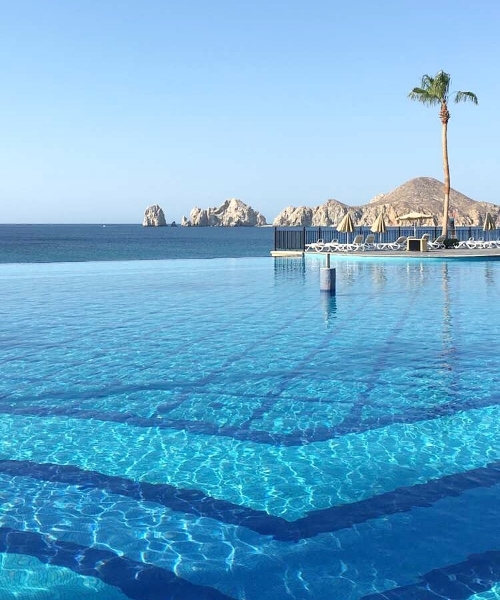 Some Snapchat filter fun in Cabo. 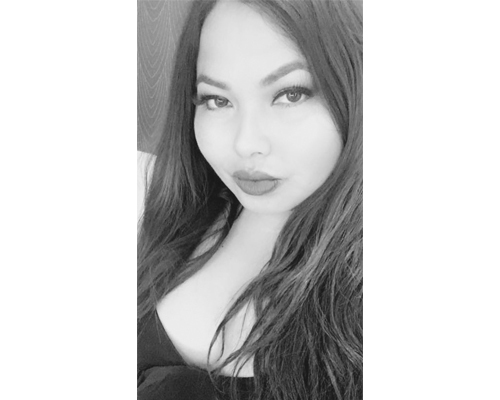 Find me at Cali_beaute. I hope you enjoyed my image heavy post. 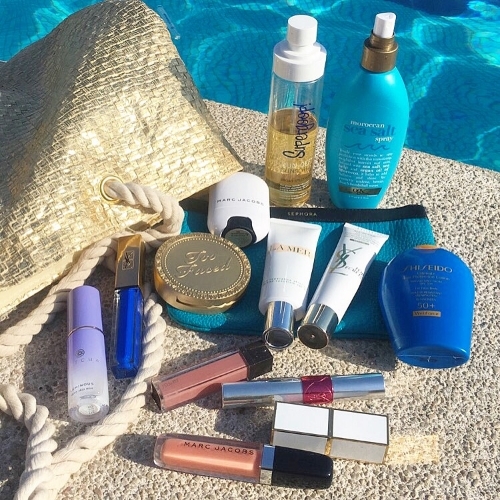 I’d love to know what beauty picks make your list when it comes to travel. Is there a product that I need to check out? Please do share in the comments below.